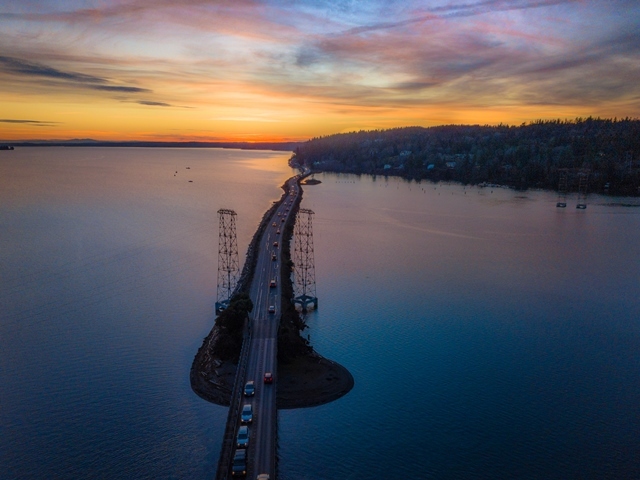 Tacoma Power replaced the towers and power lines that cross Henderson Bay and Burley Lagoon near Purdy. One steel pole replaced the four lattice towers in the water, built in 1926. Project construction finished in October 2018. Why do the existing towers need to come down? The towers and foundations have far surpassed their expected design life. More than 90 years old, they are the original towers for the Cushman lines at Henderson Bay. Has Tacoma Power completed any similar projects? Yes. 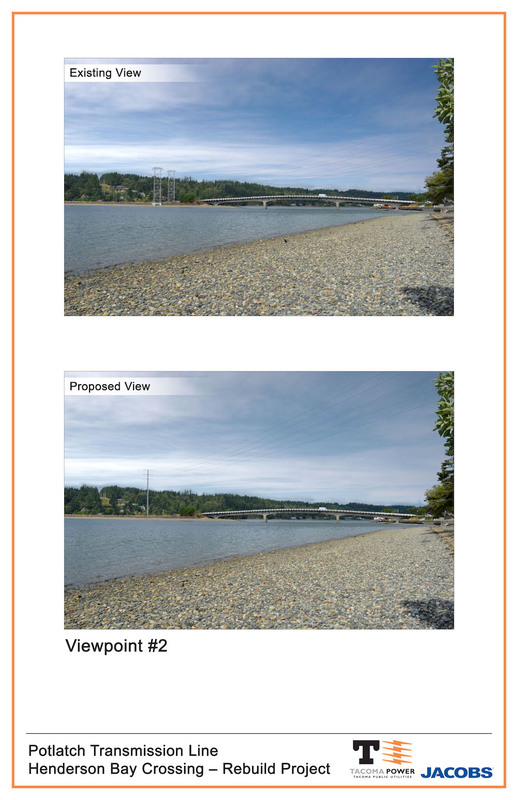 The Henderson Bay crossing is the third of three marine crossings on the Potlatch Transmission Line that Tacoma Power will replace. The Narrows and North Bay crossings were replaced by Tacoma Power in 2006 and 2014. All were part of the original Cushman Hydroelectric Project dedication by President Calvin Coolidge in 1926. The transmission line transmits electrical power to Tacoma Power and Peninsula Light Company. What activities have been completed so far? Trimmed trees along maintenance roads and the transmission line, including an existing osprey platform site near Purdy Drive. Installed orange colored bird deterrents on the top and legs of the towers to keep osprey, eagles, and cormorants away. Built access areas adjacent to the new on-land tower locations. 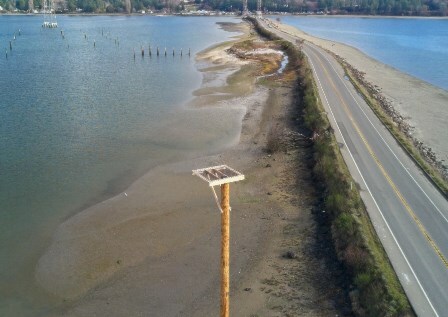 Installed a new osprey nesting platform on the Purdy Spit with the help of Pierce County Parks and Recreation. Between April and May, Tacoma Power installed four new on-land poles. What is the replacement plan in and around Henderson Bay? 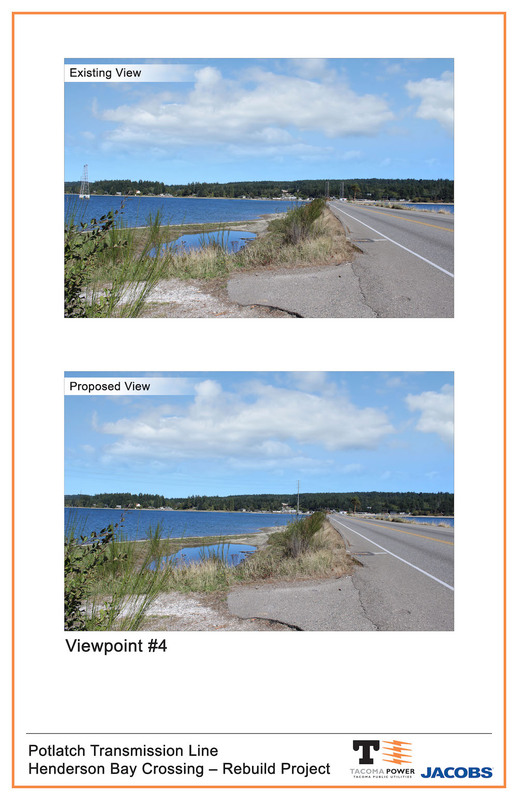 The two towers in Burley Lagoon and the two flanking Highway 302 on the Purdy Spit will be removed; they will be replaced with one in-water pole on the north side of the Purdy Spit. Only one new tower is required in Burley Lagoon to do the work of the four original towers. 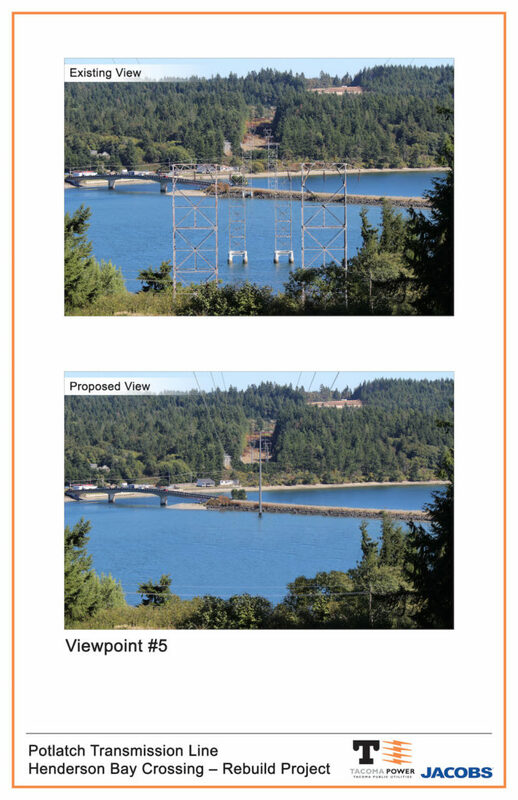 The two towers on the land on the west side of Burley Lagoon, near Goodrich Drive, and the two towers on land on the east side, near the Purdy Substation, will also be removed. They will be replaced with four new poles. The six existing power lines will be replaced with six new lines. Why was this option chosen? This option offers the least impact to the environment, people in the area and customers. What other options were considered and why weren’t they chosen? A direct one-for-one replacement of the eight towers would have increased construction duration and imposed unacceptable risk to the environment. Removing all the existing towers from the water to span wires across both Henderson Bay and Burley Lagoon required extremely tall towers on the shore. Replacing the towers with an underground system under the lagoon would have a substantial impact on ratepayers. Where will the new poles be located? What are they made of and what do they look like? All of the new poles will be located on existing Tacoma Power property. The new pole design is now standard in the power industry and balances the needs of construction, maintenance, safety and appearance. Will the height of the power lines that cross the water be increased? Yes. 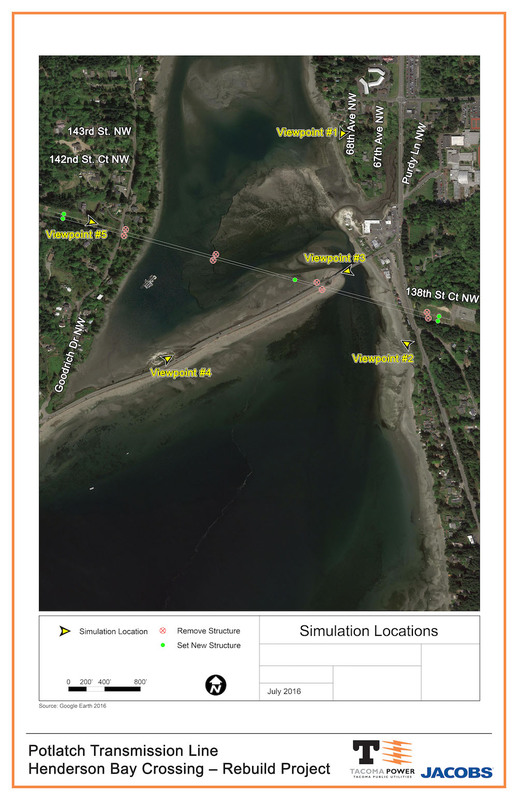 We will meet the current National Electric Safety Code (NESC) and the Washington Administration Code (WAC), which will result in an increased line clearance from 30 feet to approximately 50 feet during high tide. Why are new towers taller than the existing towers? 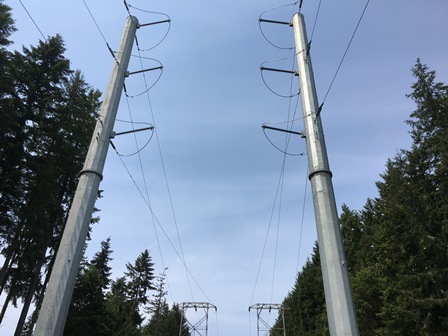 Since the original installation, electrical clearance requirements over the water and roadways have increased, requiring additional height for any new towers. In addition, the plan to reduce the number of towers in the lagoon increases the height of the remaining towers to adjust for the large span of wire. Tacoma Power will require a zoning code variance from Pierce County for any new towers for the project. What’s the process of tearing down the old towers? Will the water and sea life be disturbed in the process? We will use cranes mounted on barges to install and remove the towers. We will be consulting with the Washington State Department of Fish and Wildlife, the National Marine Fisheries Service, the State Department of Ecology, the U.S. Army Corps of Engineers and Pierce County during the permitting process to limit and address impacts on aquatic life and marine habitat. What will happen to the osprey that nest on one of the towers and the eagles that perch there on occasion? Osprey like to nest high enough to provide a view of the water and is near the shoreline. We have found a viable site that meets those qualifications and have installed a new nesting platform for the osprey to nest. We also improved the current nest platform site near Purdy Drive as a backup. We were successful at relocating an osprey nest from one of our towers at North Bay and hope to achieve similar success with this project in the Burley Lagoon. Will State Environmental Policy Act (SEPA) documents be available to the public? 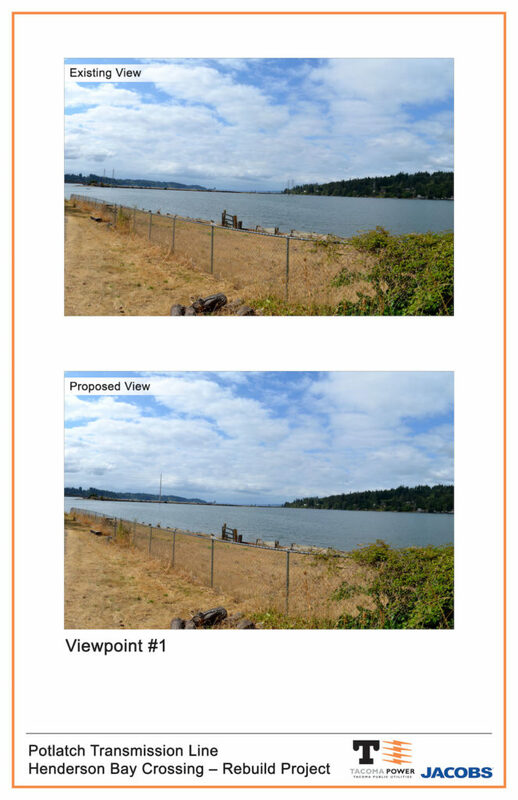 As part of the SEPA, Tacoma Power has evaluated the environmental consequences of the project. Impacts have been or will be mitigated through the requirements in local, state or federal regulations. Tacoma Power issued a Determination of Nonsignificance (DNS), SEPA File # LU16-0185, on August 25, 2016. Notice of public comment periods included a legal notice in The Peninsula Gateway and signage posted along the project corridor. 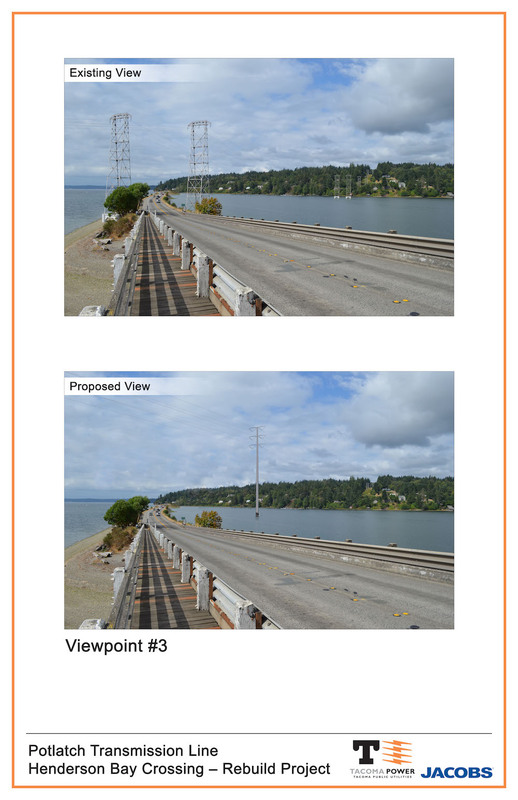 Will removing the old towers on the Purdy Spit damage the bridge or roadway? We are planning to remove the tower foundations on the spit. 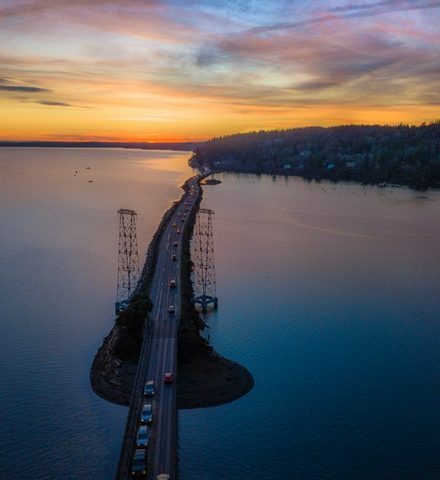 We will be working with the Washington State Department of Transportation and Pierce County to determine how much to remove to maintain the structural integrity of the existing infrastructure. Who receives power from the transmission line that crosses Henderson Bay? The lines are owned and operated by Tacoma Power. The line provides power to Tacoma Power’s system from our Cushman Hydroelectric Project. In addition, the line provides power to Peninsula Light’s substations, thus serving Pen Light customers as well. How will power be provided during construction? The existing power lines will be maintained during construction. As the new structures are installed, the power will be transferred to the new lines and structures. Take a look at photos of the existing towers and simulations of what the same area looks like under the new plan.